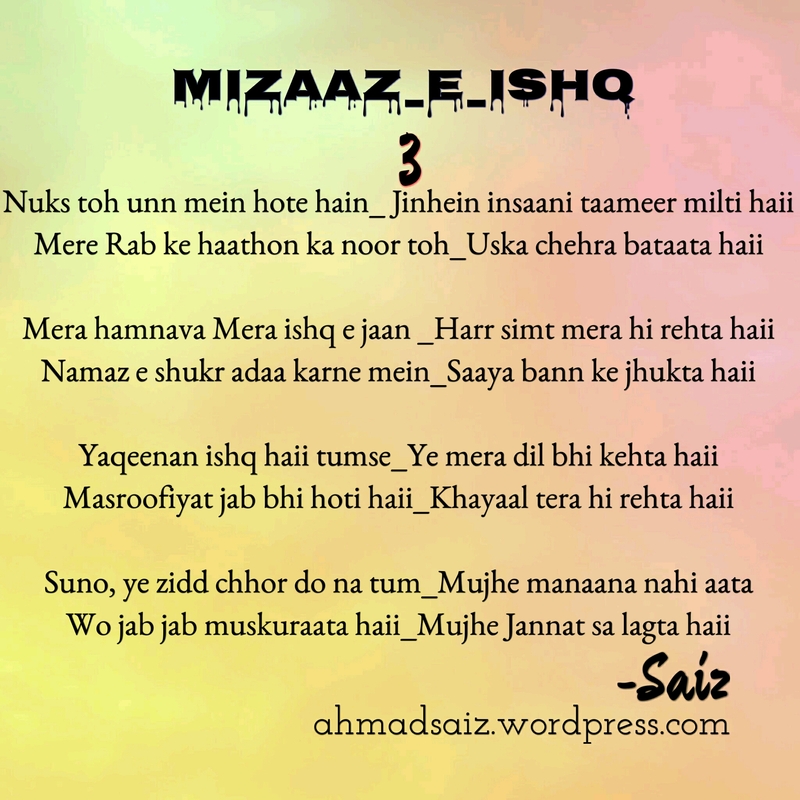 Mizaaj e Ishq: #3. ~Nuks to unn mein hote hain… – I'm Here; Right Here. No English translation this time. Not because I could not do it or I did not have time. But, because this one is special. Incomparable is what I call it. wah wah kya baat hai janab….first two lines are just amazing…and lines of masrufiyat..uff kya kehna.this line really goes very well with my situation. Thanks so much farheen Ma’am. And I forgot to tell you that I did Liebster award post, the one in which you nominated me. Here it is. Answers to your questions. Ohh neki aur puch puch…karo karo dedicate 🙂 Hey you had told me about libster award answers. I think I forgot to comment on that. Will do it In Sha Allah. MashaAllah you have a way with words! How. How do you do this? Limiting this to three this time. 🙂 Sorry about that! Oh. I’m gonna miss it. Because I was left speechless. I didn’t have words to say what I felt about them. This didn’t even need English translation because the beauty of your words transcends it. And the last two lines are so beautiful that it made me smile. Thanks a lo Ma’am for being a magnificent motivator. I am glad the hard work payed-off. Thank you so much for being such a nice reader and taking time commenting upon it. My pleasure Ahmad. Glad to have your beautiful poetry decorating my feed each day.